First, a disclaimer: Anyone who follows news from China knows the only certainty is change. And anyone who has traveled there, even briefly, knows that the “facts” vary from one speaker to another—as they do, I suspect, in any country on the globe. Here, I’ve decided to go with the facts as they were told to us by Allen (our tour director), local guides and others we met along the way. Please bear in mind the facts may have changed, the speaker may have been misinformed or may have mixed fact and opinion, or (oh, horrors!) I might have misunderstood and misinterpreted. Nonetheless, here’s some pretty interesting stuff, learned during a tour in 2013. Education: Children are required to attend school for grades 1 to 9. Home schooling is illegal. At the end of their 9th grade year, all take a 3-4 day exam which determines where they may go to high school. There is ongoing debate about the fairness and wisdom of using a single exam as the exclusive determiner of a student’s high school fate. Upon completing 12th grade, students take another exam to determine whether and where they can advance to college. High school tuition is $500 per semester and college, $5,000. The top 20% of students receive scholarships, however, and others have access to no-interest student loans. Schools are closed during July and August. Students are discouraged from participating in sports or being involved in music or hobbies, however, because these take time from academics and are not tested. Many blame this for what they see as a lack of creativity in Chinese society, and in order to broaden children’s experience, some parents pay to send their offspring to special schools which encourage activities beyond academics. Employment and Retirement: All adults are expected to work unless disabled and, in fact, some factories are designed to accommodate workers who have a variety of physical and mental challenges. A worker who loses a job may draw unemployment for a maximum of 12 months. Though there are a few beggars, there are no homeless; simple shelter and food are provided for all. Most workers have three weeks off each year—one week for Chinese New Year, another in early May, and a third in early October. The normal work week is five days. “Experienced People:” Those we call “seniors” in the U.S. are called “experienced people” by the Chinese. Male factory workers retire at 60; females, at 55. After retirement, because apartments are so small (some only 400 to 600 square feet), retirees spend much time in parks or community centers, where they sing, dance, exercise, and pursue other interests. In Shanghai, we visited the Cao Yang Activity Center where many experienced people were engaged in dance, singing, pingpong, computer instruction, and crafts. We were told it was one of 250 such facilities in the city, all government supported. 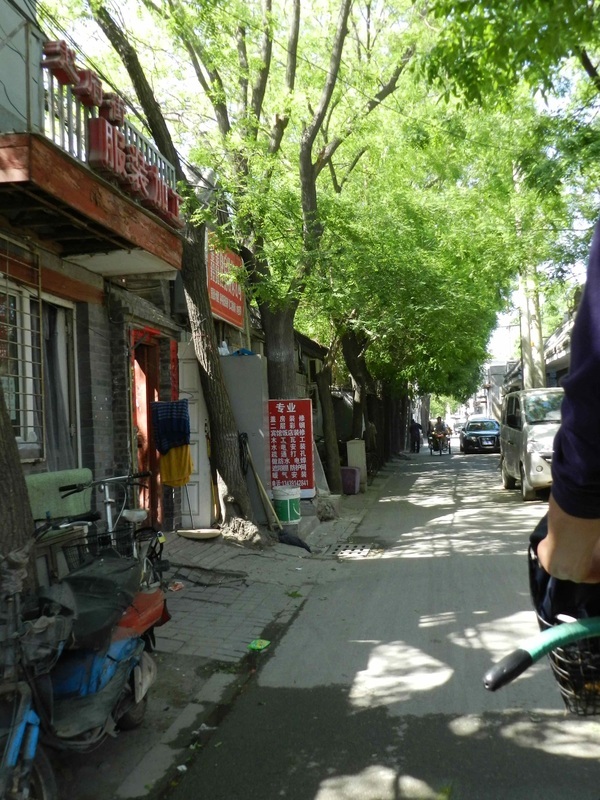 Each center serves a neighborhood—the “neighborhood” of Cao Yang consisting of 95,000 people! Death: Many Chinese believe that when you die, you go to heaven, and death is regarded as a happy occasion. They often dance around the coffin all day and all night before cremating the body. Cremation is the law of the land because of the large population and shortage of space. However, we saw marked graves as we traveled through the countryside and were told farmers don’t practice cremation. The government generally turns a blind eye to that rural practice. The One-Child Policy: The infamous one-child policy, currently being phased out, didn’t actually forbid more than one child, Allen told us, but in most cases only the first child born to a couple under that policy received free medical and educational benefits (pre-school to grade 9) from the state. If a couple had more than one child, they were fined the equivalent of six months’ salary and had to pay that child’s medical and educational expenses themselves. Exceptions were made in the case of twins or other multiple births. Couples also were permitted to have a second child if their first was mentally challenged or died before the age of 18. In addition, farm families were routinely permitted two children. Without this policy, the population, which now stands at 1.5 billion, would be twice that number. Thus, the policy achieved the aim of controlling population growth and limiting the stress on resources. However, there were also negative consequences. When the policy was instituted, average life expectancy was 53. Now, it’s 78 for men and 82 for women. Typically, then, the work of one worker supports six retirees (two parents and four grandparents). A significant gender imbalance was created since parents would often abort a female, hoping eventually to get a male child instead, as males are preferable in the Chinese culture. As a result, there were only 100 girls for every 107 boys, who then frequently remained unmarried, with attendant social issues. It is now illegal for a doctor to tell the parents the gender of a child before birth. Extended families, with the support systems they provide, began to disappear. With only one child, that child had no cousins. 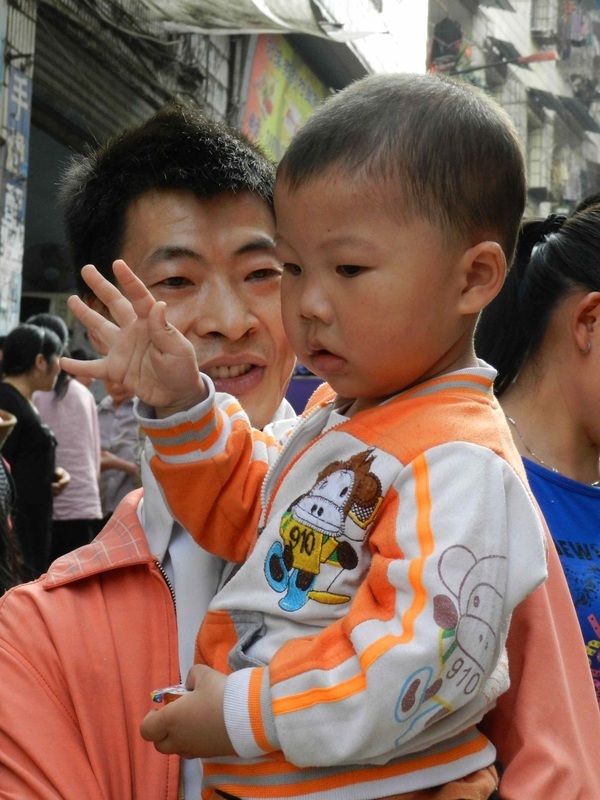 As a result, the government is moving towards a two-child policy and couples are expected to be penalized only for three children or more. Money and Income: The current exchange rate is approximately 6.1 yuan for $1 U.S. Average middle class income in Beijing is $100,000/year. The current unemployment rate is 4.5%, up from 2.1% in 2008. While the political system is still carefully controlled (see Government and Laws below), the economy is much freer; people are not starving and life has improved greatly over the past 30 years. Private Property: Before the 1970’s Chinese were not permitted to own apartments and had to rent from the government. Now, ownership is allowed, but apartments are quite expensive. A 600 square foot apartment in Shanghai could cost as much as $360,000, and a small dwelling in a Beijing hutong, the old traditional neighborhoods, as much as a million. Farmland remains under the control of the government, which assigns land to farmers every five years at the rate of ½ acre per person in the family. Each farmer decides what he wants to grow, how much he wants to keep for his family, and how much he wants to sell. Farmers earn approximately $3-4,000 per year; the government provides housing. Medical Care: In the government-run health care system, doctors are allotted only 2-3 minutes per patient, and many wait in long lines to get attention. Doctors in the public health system are poorly paid, and tipping prior to surgery in order to ensure quality care has become the norm. “Tips” can run several thousand dollars. The alternative is to purchase expensive medical insurance or pay out of pocket at a private facility. Physician-assisted suicide is available but is rare; only three cases have been reported in the past 10 years. There is no public dental care, and according to Allen, many Chinese have poor teeth as a result of neglect. Government and Laws: While Chinese leaders claim to have free elections, only the names of communist party members appear on the ballot and other parties are not permitted to run candidates. There is greater freedom of speech, however, than there has been in the past. As recently as 10 years ago, a party member would have been with us on the bus to monitor what we were being told; that is not the case today. Inhabitants also are much freer to leave the country now than in the past. Gun Laws: It is illegal to own a gun in China, and the murder rate is very low. Although “underground” guns exist, none of our tour guides knew anyone who owned one. Even the police don’t carry them, using instead only tasers and radios for protection. Drug Laws: Street drugs are illegal, and the death penalty can be imposed for possession of more than 5 grams of any illegal substance. Drunk Driving Laws: A blood alcohol level of .08 is considered intoxicated, and drunk drivers are treated severely. First offense: loss of driver’s license for a year and 15 days in jail. Second offense: loss of driver’s license for life and 30 days in jail. As a result of these stiff penalties, providing transportation home for drinkers has become a thriving business. Traffic Laws: Only cars (not the ubiquitous bicycles and motor scooters) stop for red lights. Pedestrians cross at their own risk, something Bob and I perilously learned on our own in an early morning walk before our orientation meeting our first day in Beijing. Air Conditioning: Summer temperatures often hit 110 or even higher. Air conditioning is controlled everywhere by the government; thus, hotels and their guests can’t change the room temperature. Some places have no AC until July or August. Pollution Control; China is planting millions of trees to combat pollution, mitigate the heat, and capture some of the dust blowing off the Gobi desert. (We left windows open in our Beijing Hotel one windy day and returned to find a fine layer of dust on everything.) 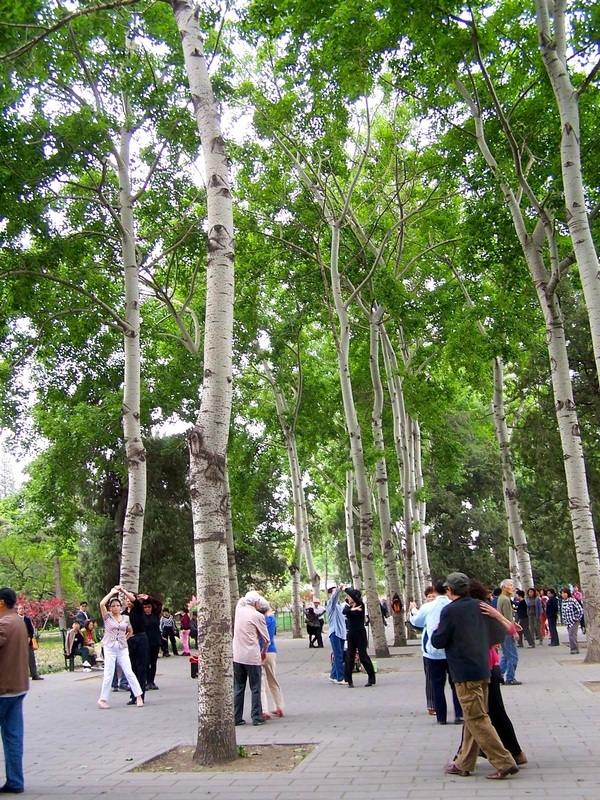 In Beijing, trees have been planted in about 10% of the available space; in Shanghai, the figure is 17%. China doesn’t harvest trees and, in fact, imports chopsticks from the U.S. Ethnicity and Language: There are more than 50 ethnic subgroups in China, and many of them speak distinct dialects. The official language is Mandarin, a tonal language in which words change meaning depending on the tone in which they’re spoken. For instance, the word ma means “mother” if spoken in a flat tone; “numb” if spoken in a drawn-out tone; “horse” in a rising tone, and “to curse” in a sharp tone. Peking, the original name of China’s capitol city is a Cantonese word. In 1949, Mandarin-speaking leaders changed the name to Beijing. Customs: In such a diverse and evolving country, inevitably customs vary somewhat from place to place. A smattering of those we encountered . . .
After marriage a woman does not change her last name. Jade is to the Chinese as diamonds are to Americans. The price of jade varies with the color and quality of the gem. Some women soak their jade jewelry in water overnight, then use the water in the morning to wash their face; they believe this helps them maintain good skin tone. Restaurants and hosts for home-cooked meals generally serve food on large “lazy Susans.” Guests turn the roundtable and serve themselves on the small plates they’re provided. A large variety of foods is served at each meal. Pork is the main meat in the Chinese diet. Soy sauce is served only if the rice is considered inferior. The Chinese believe that spicy foods help keep the stomach warm and sour foods aid in digestion. Wheat and sweet potatoes are grown in the north, where a staple of the diet is noodles rather than rice. 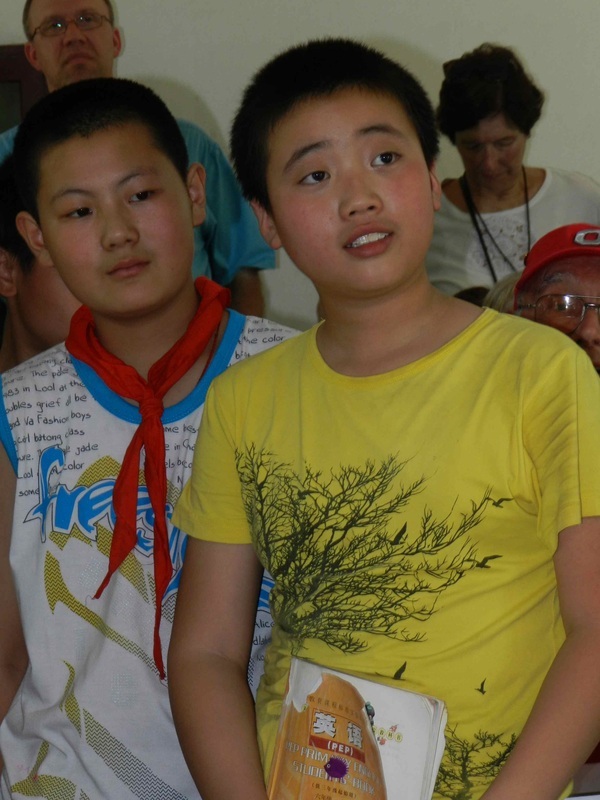 As a result the northern Chinese tend to be taller than those who live in the south and eat more rice. There are no laundromats. Hence, the ubiquitous clothes hanging on balconies or outside apartment windows. 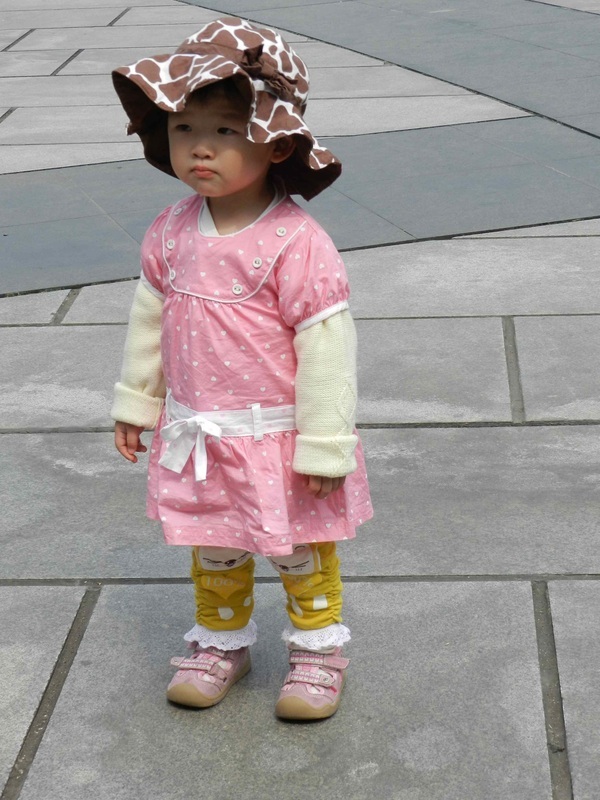 Most Chinese are happy to let you photograph their children. However, taking photos of the police in action can get you into trouble. We were told to refrain from doing that. The major religions in China are Confucianism, Buddhism, and Taoism. And Finally: . . . China is a sprawling, vibrant country made up of diverse people and cultures. Sometimes it’s frustrating, when visiting a distant land, to know that we’re seeing only a tiny bit and absorbing a meager amount of what there is to know. However, just being there, soaking in the sights, the smells, the sounds, the sensations of the country is reward enough. At any rate, it will have to do. 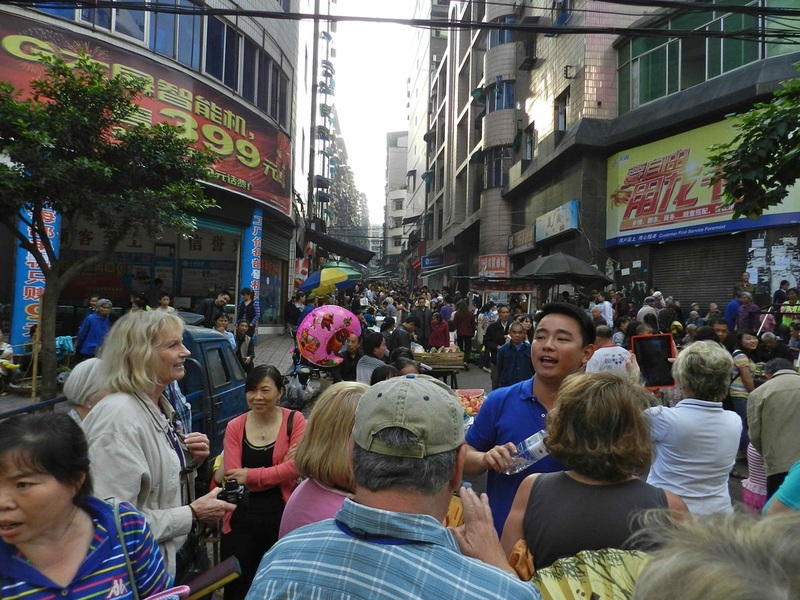 A crowded street in Fengdu, above the Yangtze River. Fengdu grew from a population of 100,000 to 700,000 when villagers were moved from their homes which are now under water as a result of the creation of the Three Gorges Dam. Boys at a school we visited listen to a brief talk by our tour director. Later, the students and travelers mingled to get acquainted. "Experienced people" dance to music from a boombox in a park in central Beijing. We found parents very receptive to our requests to photograph their children. Here, a father in Fengdu stops to accommodate us. Exiting the Chongqing zoo, we passed this little lass. Judging by the expression on her face, I don't think she was ready to go home. A typical hutong street, lined with small, one-story residential and commercial buildings. 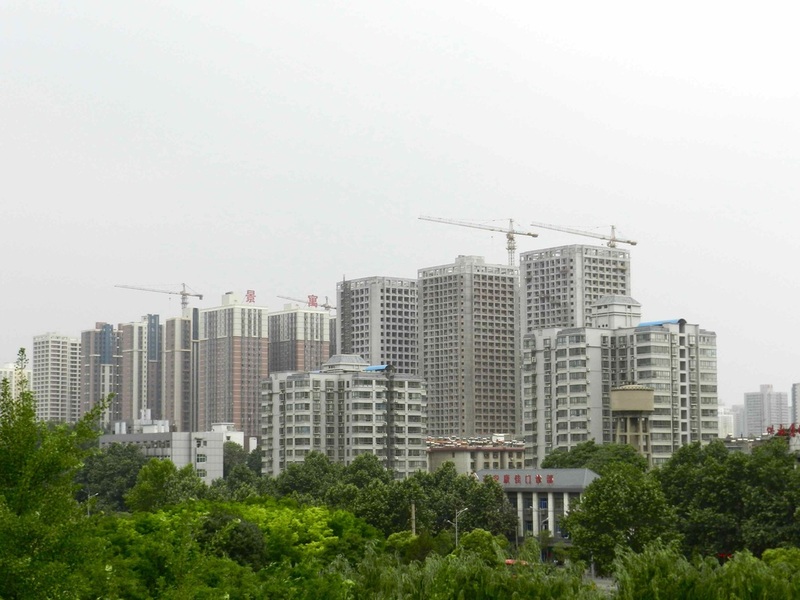 New high rise apartment buildings go up in Xian. The photo was taken from atop the city wall which encircles the old section of the city. 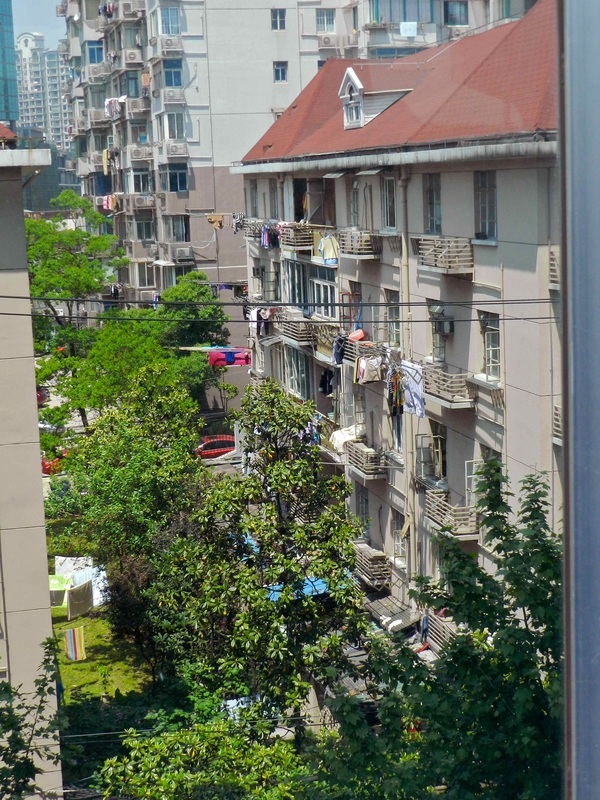 A familiar site throughout China, laundry hangs from balconies in Shanghai. 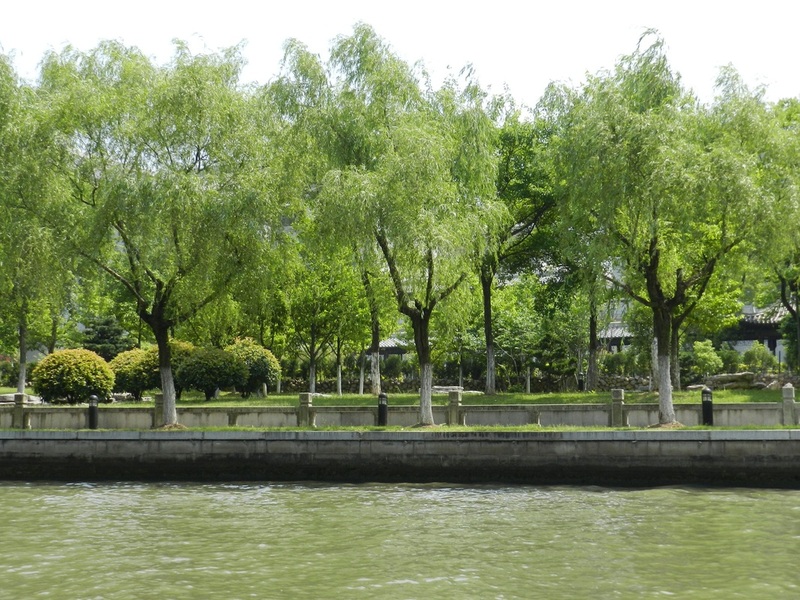 Planted to aid in controlling pollution, trees line a canal in Suzhou, sometimes called the Venice of the East. A bride prepares to pose for a pre-wedding photo in Beijing. Brides in China traditionally wear red, which symbolizes good fortune in that culture. 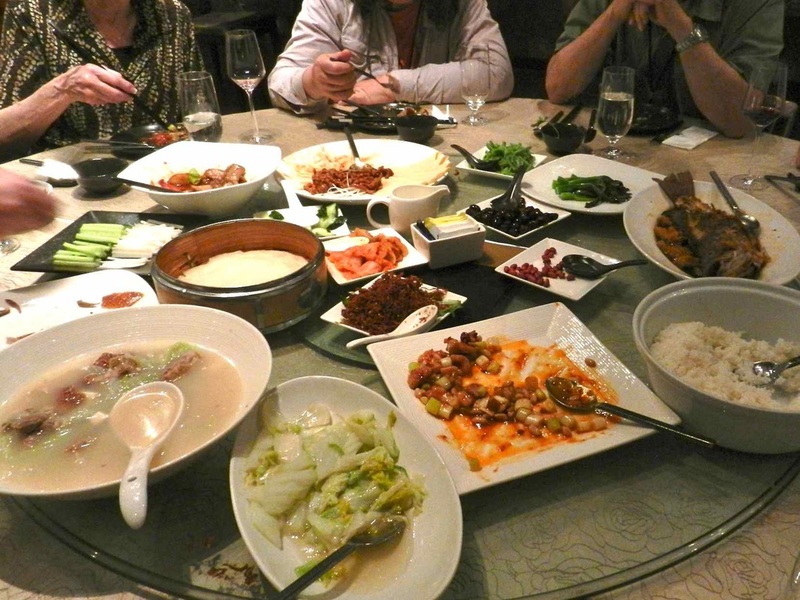 A typical array of dishes at a scrumptious Chinese restaurant meal.